After Aideu Handique acted in the first Assamese movie in 1935, she was ostracised for almost her entire life in her village because she had called a male co-actor “Bongohor Deu”, as husbands used to be addressed by royal Ahom women, despite being unmarried. The heroine of Jyotiprasad Agarwalla’s Joymoti was forced to live as a spinster as nobody would marry her after the acting stint, a ‘taboo’ for women in those days. And to make matters even worse for her, she never got to watch the film, except for catching up with some surviving scenes screened during the Golden jubilee of Assamese film industry in 1985. Joymoti itself was a path-breaking movie for its realistic treatment unheard of in Indian cinema of 1930s, but for Agarwalla it was a financial disaster as Assam hardly had any movie halls those days to screen it. What could be then more ironic than the fact that Handique, who died in 2002, could again not watch a film – Aideu – Behind the Screen – on the tragedy of her life, made by a cash-strapped director who wanted to pay tribute to her enforced sacrifice for the cause of cinema, despite briefly appearing as herself in it? The director, Arup Manna, himself has been forced by the prevailing circumstances, with cinema halls are closing down dime a dozen in Assam, to face a fate like Agarwalla, with his film not even getting a proper release despite picking up its fare share of international accolade and a national award. Handique was virtually abducted by a cousin of hers who took her to Agarwalla who was looking for a young girl to act as Joymoti. The role in question was of a legendary 17th century Ahom princess who had been tortured by the ruling establishment because of her refusal to disclose the whereabouts of her husband and the legitimate claimant to the throne of the Ahom kingdom. When she returned home at Panidihing village in central Assam after participating in the shooting across the Brahmaputra near Tezpur, the villagers threatened to ostracise her whole family if she was not thrown out of house. Finallly, she was allowed to live at a ramshackle house at one corner of her family’s land, and for nearly 50 years she was forced to live like that before the Assam government decided to felicitate her in 1985. Manna’s film, despite having moved viewers in film festivals in Munich, Sao Paulo, Singapore, Dhaka, Mumbai (MAMI), Pune, Kolkata, Hyderabad, Porteballo (UK) and Habitat Film Festival in Delhi with its emotional quotient that rises above the lack of production values attributed to financial constraints, has not yet been seen by the larger public of Assam. 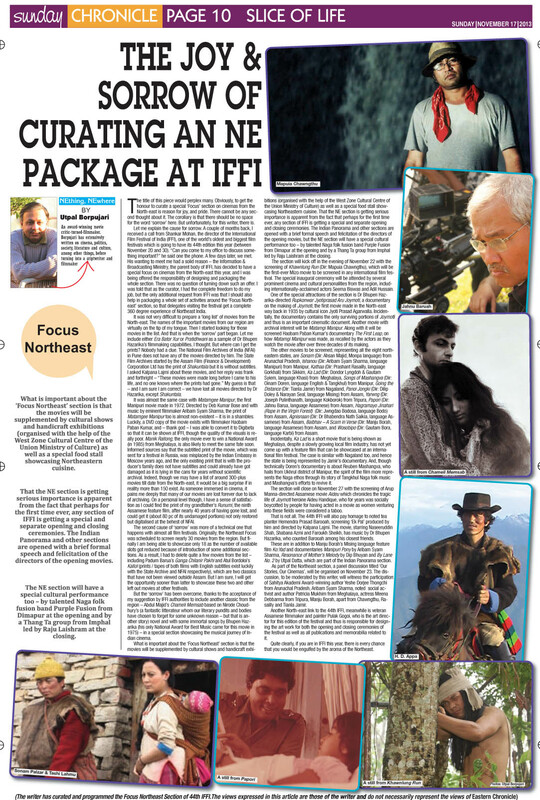 Except for a few special screenings, a very limited release in Guwahati and a few other towns and some DVD screenings arranged in make-shift auditoria through an LCD projector, the film has not yet travelled to the hinterland. “Jyotiprasad never returned to inquire the fate of Aideu Handique after she was sent back home with a trusted lieutenant of his. If Agarwalla was guilty of it, I too feel guilty of somehow exploiting her as I could not show her the film,” Manna says. The shooting for the film started in 2000, and it was completed six years later because Manna had to shoot in bits and pieces due to lack of funds. Shortly after giving a few shots as herself, Handique passed away. “She never got an opportunity to watch either Joymoti or the film made on her life that was a tribute to her sacrifice – though enforced – for the cause of cinema,” he says. The tragic life of Handique, in whose name a girl’s school was established by the government in her village after her death, has been brought alive with all its pathos by young actress Chandana Sarmah after the opening shots in which the original, ailing Handique appears. Manna says, “My film is intended to bring under focus the injustice that we as a society collectively committed against her.” Apart from the mental agony, Handique also suffered lifelong physical agony, thanks to the recurrence of pain that originated during the shooting of torture scenes in which she had been actually whipped and the protective gear made of betel nut tree leaves had slipped from its position. Manna, who had to mortgage his house in Nagaon town of Assam to make the film on a budget so shoestring – of around Rs ten lakh – that it would not be enough to shoot even a quarter of a lavish song sequence of some big budget Hindi film songs, is a little relieved that he has got Rs two lakh as prize money after the film was awarded as the Best Film in Assamese at the 54th National Awards presented recently. “If Doordarshan telecasts the film, some more of the investments will be recovered,” he says.